I completely understand and support your decision. Part of weight loss is psychological, and it’s hard to break from its grip if you’re always looking at a scale and reminded of it. Conversely, if you’re like me, I started my blog for accountability. I have strayed from being a diet blog as well, and it’s become more of a ‘me’ journal. I wonder if I’ve taken it too far from its origins. Time will tell. Truth be told, I’d love to know more about you, so I’m excited about the new direction that you’re taking your blog in. Get well soon! Thank you, Rob. I’m glad that you support the decision. 🙂 I agree, weight loss is partly psychological and it has to not have that number consume you. I did start my blog to stay accountable, but I realized that staying accountable has been a lot easier than I imagined. Suddenly, it feels like I don’t need the blog, but I don’t want to lose the support that I know I can turn to and that’ll happen if I quit. Your blog has strayed from weight loss but it’s taken an amazing turn. I think everyone likes the new direction of your blog. I know I do. You said you’d like to know more about me. What exactly would you like to know? I figured you knew me better than anyone else here. Lol! Thank you. I will try to get better soon. Perhaps I’ll look into sweating it out or something tomorrow. We’ll see how I feel then. I think if you are feeling that you shouldn’t share your weight loss number any longer then you shouldn’t, it’s all up to you. I like the idea of posts to get to know you better as sometimes we forget to share that type of information when we are focused on the numbers. I just didn’t feel like I was getting anything from the sharing anymore. Initially, it drove me to keep my journey going, but that’s not the case now. I like the idea of opening myself to you guys some more. I’m more than just this weight loss journey and I’d like you all to see that. Those libraries are both beautiful and if someone would willingly build them for me, I’d be eternally grateful. Lol! Ill be interested to learn more about you from your future posts. I think it is important to do what you feel is right re the weigh ins, I sometimes feel a little down after weight/ measure ins as I have not made much of a difference to the measurements. It is not all about numbers though. There are a whole host of aspects in our live that are improved with healthy eating and exercising. Self esteem, mood, confidence, relationships with others, how we see ourselves etc. I agree completely. It’s not all about the numbers and I just don’t want anyone to feel bad or like they’re not measuring up somehow. OO now that is a good question. I am no good at thinking things up on the spot so ill get back to you! Yeah, you definitely said reading room. Lol! I like that though. 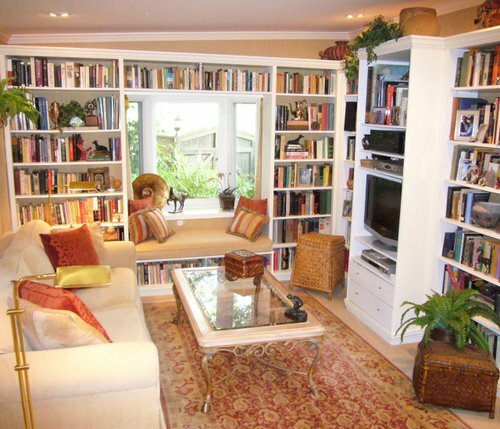 Believe me, amassing that many books wouldn’t be hard at all. Anyway, nothing beats free, right? By the way, you’re up early or perhaps I’m up late? I don’t know. This cold has me sleeping at irregular hours. Nice looking libraries. Both of them. They are, aren’t they? The first one is a little dark which wouldn’t be good for reading, but things can be done to fix that. I’d be happy with either though. 😀 That’s the point. It’s a sanctuary. 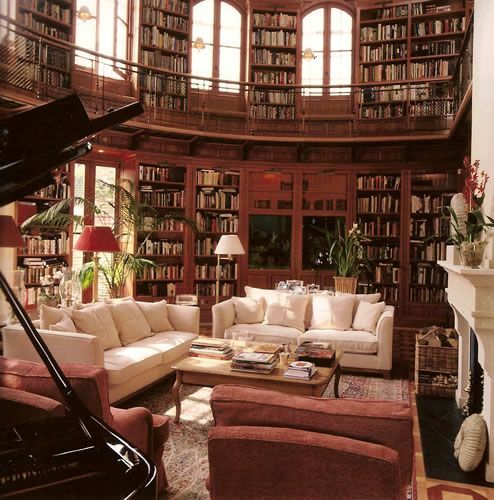 I wouldn’t mind some music from the piano as I read. I gotta see about making that a reality.